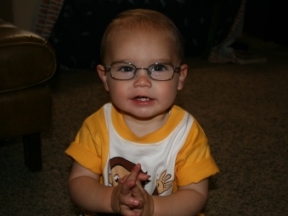 Reid – 1 year, started wearing glasses at 9 months for farsightedness. He hates his glasses, and it has been a constant battle to get him to wear them. His frames are from Excel Eye Center and they are Disney brand. I believe they have a tiny picture of Diego on them.